Making sales calls can be a challenging task for sales professionals. It can be quite intimidating to reach out to others through the phone and “sell” something. However, sales calls are a crucial aspect of keeping your business running successfully. Regardless if you are a veteran sales rep or a rookie, there are ways to make improvements. Study, practice & master these 5 components of successful sales calls to improve your sales career immediately! Your quarterly/annual review will be something you will be looking forward to! Always have an attention-grabbing opening statement. This is the same as with the in-person meeting, and it may be information you have discovered in your pre-call research. 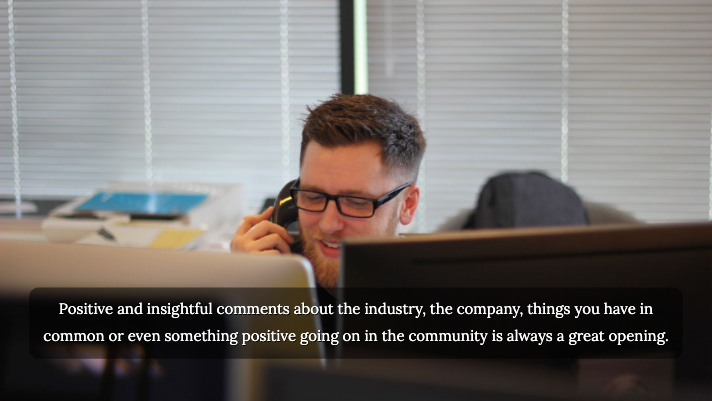 Positive and insightful comments about the industry, the company, things you have in common or even something positive going on in the community is always a great opening. Top sales professionals study, practice, & master these simple but effective telephone selling techniques. Avoid any negativity or comments that indicate you feel you are taking up their time or taking them away from something important. This not only creates a negative impression of the importance of the call, but it also plants a seed about getting off the call. While the customer cannot see you, he or she can tell if you are happy, smiling and positive or if you are distracted. In a study by the University of Portsmouth in the United Kingdom, researchers tested the ability of people to tell if the speaker on the other end of the phone call was smiling. Not surprisingly, they found that people were very accurate in telling if someone was smiling. 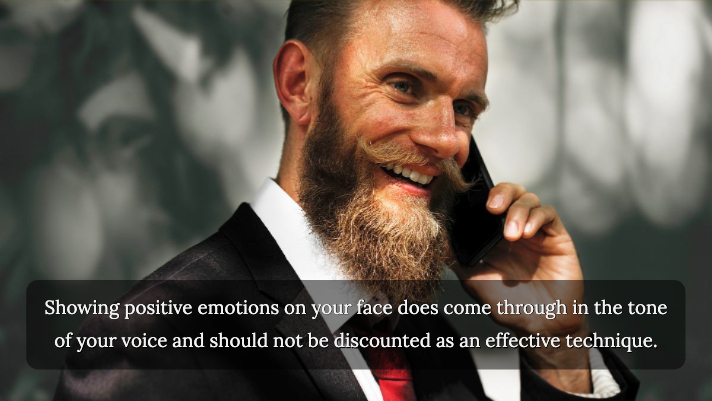 Additionally, the research also showed that when they hear someone smile on the other end of the call, they were more likely to smile as well. In sales, this is a powerful tool. If the customer is also smiling and engaged in the conversation, you have their attention and their interest. Of course, this has to be authentic, but showing positive emotions on your face does come through in the tone of your voice and should not be discounted as an effective technique. On sales calls, it can be tempting to keep adding to options, ideas, possibilities, and considerations. However, when you are on the phone, there is no way that you can see the expression on the customers face, there is a good chance of losing them in the what-ifs or even talking them out of a sale by presenting too many alternative options. Keep it simple and stick to your plan. 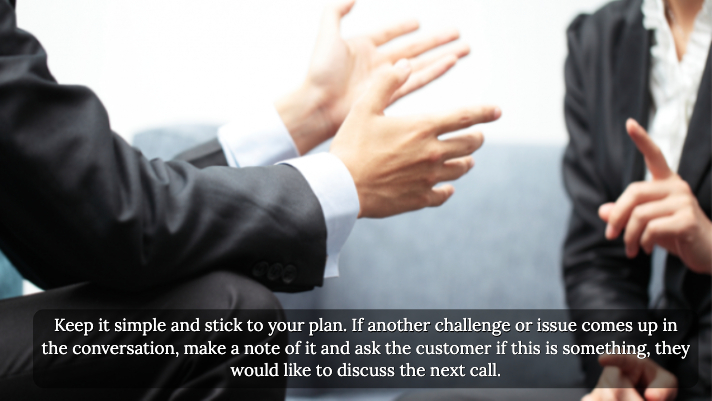 If another challenge or issue comes up in the conversation, make a note of it and ask the customer if this is something, they would like to discuss the next call. This is a great way to set up a follow-up call, which is now much easier to prep for as you have a topic and an understanding of the customer and her or his company. Being bold and passionate about the topic is not something to do all through the call, but it allows your voice and your intensity or excitement to be real and unscripted during key points in the conversation. Many people stand up and move about when they are interested, excited and engaged, and if you are one of those people, do it at these times in the conversation. 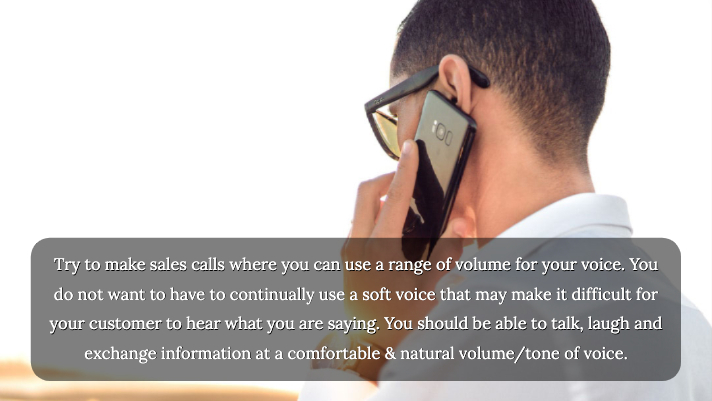 Try to make sales calls where you can use a range of volume for your voice. You do not want to have to continually use a soft voice that may make it difficult for your customer to hear what you are saying. You should be able to talk, laugh and exchange information at a comfortable & natural volume/tone of voice. It is also important to keep the pace of the conversation comfortable for the other party. Match your speech rate with theirs to avoid frustration on their half of the conversation. If you are a fast talker, slow down to avoid overwhelming the other person, particularly if they are a slower talker. There is nothing wrong with using traditional types of sales methods to emphasize the value of the product or service you are selling. 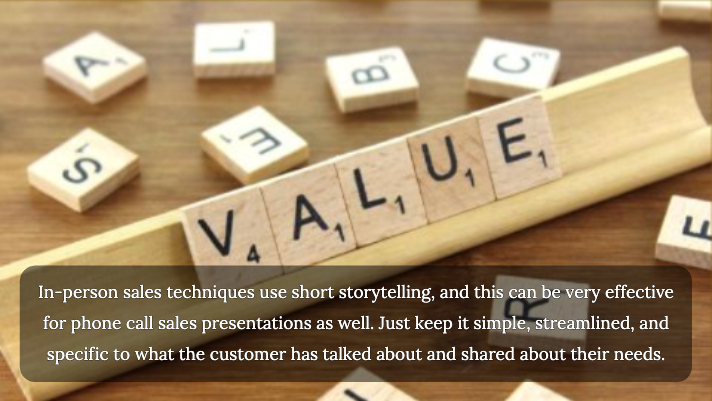 In-person sales techniques use short storytelling, and this can be very effective for phone call sales presentations as well. Just keep it simple, streamlined, and specific to what the customer has talked about and shared about their needs. In addition to the explicit value of the product or service, what are the other values making this purchase offers the customer. Can you deliver it tomorrow? Do you offer tech support for installation? Will your team come and train their team on the product or service? All of these value-added types of issues can make the difference between a sale and a “no” answer. Again, this is where knowing your product and service and weaving it into a story that resonates with your customers and shows the benefit of your product really stands out.